Alright, so here’s one of those good ol’ “makeup rules” set in place by who knows, and we’re gonna put under the microscope. So, do you or don’t you? And why? Is there a time and place for matching and not matching? Let’s elaborate in the comments. I personally think of makeup as an art, and just like all other arts, it’s open to interpretation and is free for self-expression. If matching is what makes you happy, go for it. If not, go for it. What are your thoughts? Oh!! I like you site.. very nicely organized and nice layout too!!.. I like to match my eyeshadow with my clothes only when i’m wearing my favorite colors: teal or puple. Just cause i cant get enought of those colors! I consider it a REQIREMENT to match my makeup to my daily outfit. This was a tough question, honestly it all depends on the occasion, so yes a time & place for these things. I like to do it like for fun, going to the movies with friends, going out to eat, family get togethers like bar-b-ques and stuff…. but not for a wedding or church-going or even important meetings at work. I think it does depend on what you’re wearing, but in general, I match. I also don’t do my makeup until I know what I’m wearing, and I’ll usually use my clothes as a base canvas. So if I’m wearing navy blue, I’ll at least use navy blue to blend in my crease, no matter what other colors I may choose to wear. However, I usually only do really bold colors on my eyes when I’m wearing black or just a splash of color in clothing. Im in love with those colours..
And everyone laughs at me for it..
Also, on a level, that makeup is just too stunning. It all depends .. at times i feel the neutral look and other times I match colours to my outfit. For the most part I like to wear my makeup to either match or compliment what I’m wearing.. I definitely believe makeup is like art, as well! Let our creativity shine through. Sometimes I match my eyeshadow with my outfit, but there are a lot of times I just love to use purple for the hell of it! I don’t usually match my makeup to my clothes but its more because I’ll wear green, blue, and purple eyeshadow, but I don’t have a shirt with all those colors, so I just wear whatever I want. Sometimes it does look really nice when your makeup and clothes match. It’s really up to the individual, to hell with any makeup rules, do what you want. hey! i coordinate. that means for me that it may not be matchy matchy and sometimes it may just a little. i just like for it all to coordinate. I match make-up to my clothes but not literally Example, once I was watching ‘Next’ on MTV and the girl had purple eyeshadow, shirt, nail polish AND shoes. Terrible. I go complimentary. 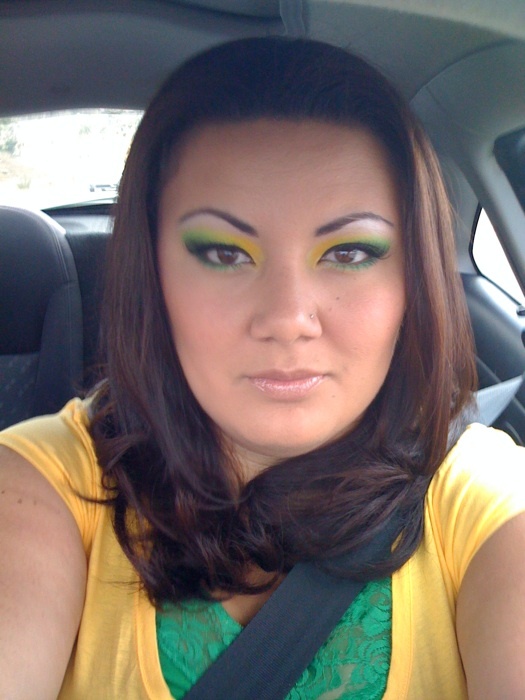 Usually if I am wearing a super bright/flashy color in clothes I go for any darker smoky eye, or something with a matte. If I have more demure clothes then I”ll put metallic teal eyeshadow on. Love matching my makeup with my outfits..Loving this colors on you.